Hey, thanks for your nifty party game ideas. I'll blog her party eventually. Right now I'm shirking my party prep duties to write this post. I should be making the cake. So I'll be quick. I've been doing little decor spruce ups around the house and you'll probably see several posts about it. I tend to leave things the same way for far too long, then suddenly I have this maniacal urge to change it all. It's happening bit by bit. This is one part of it, my new foyer plate wall. Just pretend that door bell box is not there. Man, I hate that thing. I've seen this done several times on the web, including this beautiful example by Lisa Congdon. 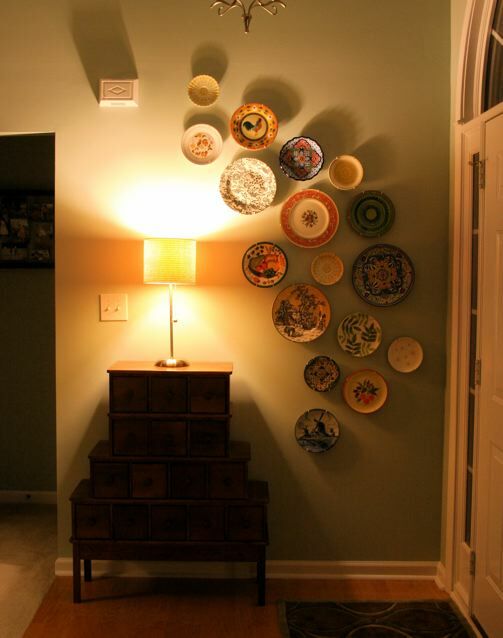 Plates were the perfect way to bring some interest and color to my foyer wall. Pretty cheap too, since I already had most of what I needed. I love looking at it. I didn't think about it too much, just did it. I had the idea the other day, so I dug around in cabinets and gathered a bunch of plates I've accumulated over the years. Some were gifts, some souvenirs, and some thrift store finds. And a few I bought recently just to fill in the holes. Then I started with three large plates in a triangle. Then I just randomly added more plates one by one until I felt it was finished. Having assorted plate sizes is a big help in giving it direction and swoop. Making new holes in my (freshly painted and mended) wall usually makes me nervous but for some reason I was able to just let go and whack the nails in without a second thought. I like the effect at night too. Ok, I gotta go make party stuff. I love your plate wall so, so, so much! I think what I love most is that it is not so uniform and it curves to give it movement. So pretty! Very pretty! I love the color of the wall too! turned out great! love the colors! This is such a clever idea. 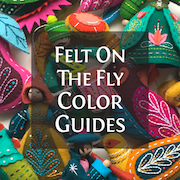 It's colorful and playful but neat at the same time. The plates are beautiful and so is the wall color. Would you mind sharing the information on the paint? Thanks in advance! Kristine, sure: Sherwin Williams Rainwashed. pdisandro - THAT IS A CAPITAL IDEA. I could probably just use some extra wall paint and see if it will stick to the plastic. totally amazing larissa. I've been meaning to try something like this in my dining area but haven't gotten around to collecting plate yet, haha! Gorgeous! So clean and fresh and happy and peaceful and inviting. I think I may need to try this in my foyer, too. Such a nice way to welcome visitors. This looks so great!! Would you mind sharing where you found that adorable little apothecary cabinet? I LOVE it! It adds so much to your foyer!!! Texture, colors! Beautifully done! Thanks, everyone! It makes me happy every time I happen to look in that direction. Big pay off for a very little amount of trouble. Lauren, I'm glad to share the info but not sure it is available now. I found it many years ago at a Sam's Club in Alabama. I fell in love, and it was only $99! I hope you can find something similar. And not just from that store. Try googling it and see what you can come up with. wow! I LOVE this! good job, yours is beautiful! I love it! The curve to the placement makes it so much more interesting than a lot of plate displays that I've seen. I love your corner, it is prefect! I love this corner in your house! :) The plates look great all together! Love your plates! Funny that you mention your doorbell box, I had no idea what that thing was til you said that. We have a partial wall that would be perfect for a photo wall or large piece of art that the builder stuck the air/heat control smack dab in the middle with the doorbell box right above it. I've often wondered if I could still do a wall grouping and conceal those two items somehow. Anyway happy party prepping :). I love the colors! And the randomness! Must start shopping for new plates...hmmm...maybe in AUSTIN??? See you tomorrow! Woohoo! Katie, there seems to be no rhyme or reason for the placement of all of the vents, returns, boxes, and light switches in our house. I can just hear the builder saying "Oh, just slap it there. That way we won't have to run any extra wire." Robyn, EEEEEEEEEEEEEEEEEE! See you there, Lord willing. Oh Larissa I LOVE this! Maybe this is what I need to be thinking of for our blank dining room walls. I better start collecting! I want to use your plate idea with some colorful plates I bought from Anthroplogie, but how do I mount them on the wall? Please tell me. Did you use ribbon to hang on a nail? What is the best way! I am terrible at hanging stuff. I hope its easy! leslieeva, it is easy. Go to the hardware store or the hugemongous everything store and purchase a bunch of plate hangers. They are thingies that have two sets of hooks attached to springs along with a place for a nail. The two sets of hooks go around the edges of the plate to hold it, and then it fits over the nail in the wall. That's how I hung all my plates, except for the ones that already had a hanging loop in them. Good luck! @Larissa - I am definitely going to try this idea, I love the way it looks! Question - I am planning on doing it on a slanted wall, my apartment is the second floor/attic so the ceilings are angled in. Do you think they will stay on the slant and not fall off? Laura, I wouldn't recommend this method for a slanted wall. The kind of hangers I used would not work for that. You'd need something to adhere the plate to the slant so it doesn't hang off. Maybe explore the possibility of 3M picture hangers? They are kinda like velcro that you can peel off later without marring the paint. Thanks Larissa! I tried the 3m strips and they work pretty well...I had to double some of them because the bottoms of the plates had that indented ridge, but it worked well and seems to be holding up. Thanks so much for the great idea!! Laura, I'm so glad it worked for you. But be careful, I don't want you to get konked in the head by a plate! Love this! And I love that the plates don't have to be matching! i credited you, of course. WoW! I love your style and I especially love Who you stand for. I don't ever follow blogs from people I don't know but you had me in the first sentence of your bio. Plus Girl, you've got style! Cheryl, made me laugh! 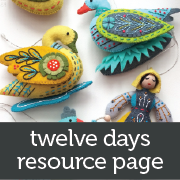 Thanks and welcome to the blog! 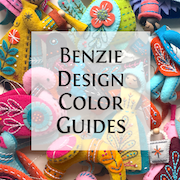 Your wall is gorgeous, it's all over blogland too! I've linked it to my plate walls post as well today, for inspiration! 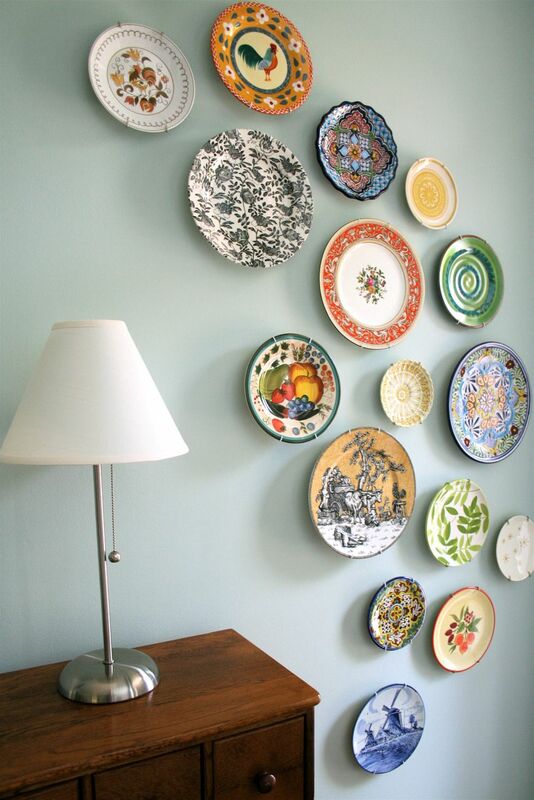 I love, love, love your plate wall. You managed the perfect swoop up and around the chest and lamp. Thanks again, y'all, for all the kind remarks. I'm still loving the effect of the plates on the wall. Still haven't painted the doorbell box though. LOL. This gives me incentive to possibly use them in my studio. Hi, Carole! Thank you! Yay for getting to use something stowed away in the cabinet. I was happy to finally use mine too. 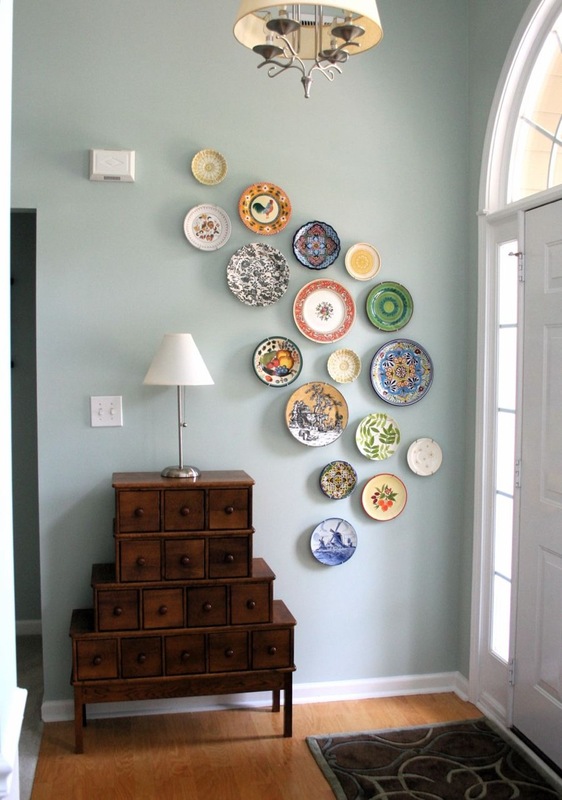 LOVE your display of plates for wall art! Gorgeous! Pinned for inspiration! Thanks for sharing! Thank You Thank You for sharing your faith on your blog. Just today found you from the 9/13 LHJ. I love doing odds & ends of plates I get from all over. I have a bunch but for some reason the plate hangers just don't work on some of the plates. Any idea why not? they just stick out from the wall too much I'm afraid they'll fall off. Lovely way to welcome life into your home. Hi, Roz! That's so nice of you to say! Thanks so much! My wall color is Sherwin Williams Rainwashed. I especially like this decorative wall. This is really creative. I am also ready to try. I have never seen this plate sticking to the wall for art.